Hundreds of thousands of phone apps, tens of thousands of desktop applications yet you can't find the right software to fit your needs? No problem! Although there are countless software products available, quite often, there's still a void that all those programs just can't fill - be it simple or small, involved or novel. So, when a core aspect of your business relies on computerized systems to function or to reach clients, you absolutely can't compromise your business practices to use off-the-shelf software. 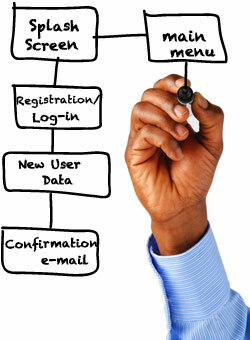 Instead, you need a precision tool that performs in-step with your business methods. A custom software application is that tool. If it sounds overwhelming or crazy to consider, it's not. SPIA is a very experienced custom software application developer. We've created some of the most unique applications ever used in retail, plus business software, lots of web based projects, and mobile too. No matter what you want to achieve via computer, mobile phone, kiosk, digital sign, or... you name it, we'll work with you to develop creative and compelling approaches to solve your software requirements. Our repertoire spans just about anything including applications for: promotion, advertising, branding, marketing, gaming, customer loyalty, automation/efficiency, data acquisition, metrics/analysis, and more. We'll lead you through the process effortlessly - from planning through implementation, always focused on making your project extraordinary and cost effective. And nothing goes out our door unless it has been thoroughly tested and meets our standards of reliability and hardness. Fact: we have a 100% up-time record spanning all of our interactive software since 1997!